I ate Miz’ Rawlings grapefruit this morning. Sweet and juicy, a far cry from the thick skin commercial varieties sold in grocery stores. The best tasting Florida citrus are thin skinned and crack open when they hit the sandy turf. The fruit from Cross Creek was chock full of seeds too, obviously not bred for travel to faraway markets. Marjorie Kinnan Rawlings house. Cross Creek State Historical Site, Florida. 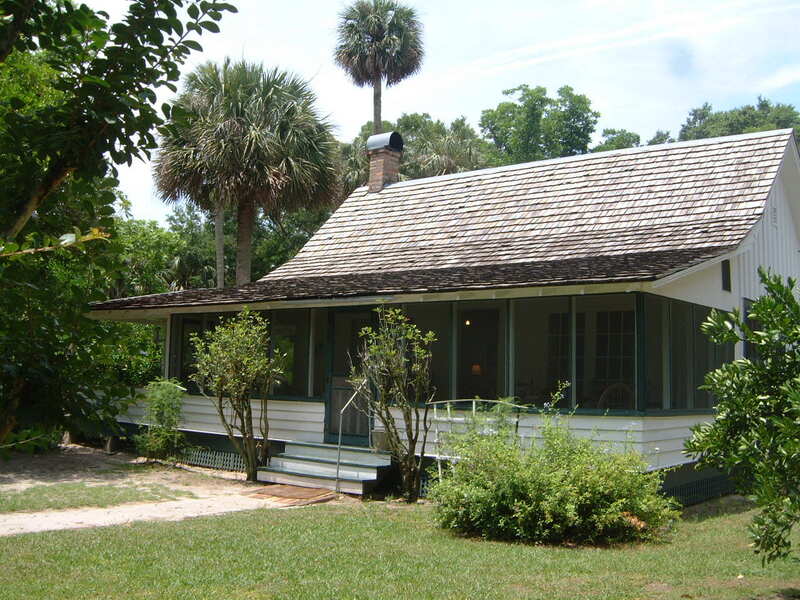 author Marjorie Kinnan Rawlings’ farm in north central Florida. He wandered barefoot through the writer’s house and citrus grove, leading a dozen tourists through the historic property. “Sand sticks in running shoe crevices, not to bare feet,” he says, dusting his soles against his tattered pants legs. Lee’s aw-shucks, gee-willikers style brings to life Rawlings’ backwoods characters in popular books like The Yearling and Cross Creek. Rawlings won the Pulitzer Prize in 1939 for The Yearling. Beloved by many young readers, the novel tells of local boy Jody Baxter’s coming of age in Florida’s hard scrapple northern pine country near Ocala Forest. Her novel displayed contemporary realities in realistic voice and bridged subject and stylistic antipodes. The 1938 Pulitzer book, John P. Marquand’s The Late George Apley, hewed closer to 19th century novel forms and subject matter, while John Steinbeck’s Grapes of Wrath, the Pulitzer winner in 1940, was a thoroughly modern novel rooted in vernacular voice and character. When she came here in 1928 with first husband Charles Rawlins, both journalism graduates from the University of Wisconsin, Marjorie Kinnan Rawlings was a neophyte Floridian who thought she could live off the orange grove. The farm was planted with pecan trees, which she ordered cut down to plant citrus.